It's been a couple of months since I've returned home from my Trek America trip, so I've definitely been reflecting on some of my highlights from my experience! I'd love to share these with you, since I feel so incredibly grateful to have these memories with me. If you didn't already know, I embarked on a 10 day adventure with Trek America in May, on their Deep South BLT tour! It was out of this world, and has made me fall in love with America even more. Now, I know I've spoken about the awesome nightlife experience I had in Broadway Nashville, but then I experienced a slice of New Orleans. What I loved about New Orleans is that the streets weren't AS crazy packed with people compared to Broadway in Nashville, this meant for a little more room for walking about which I'd always prefer. The streets are alive in New Orleans though, street musicians fill the walkways and roads with beautiful jazzy sounds. This also brings out the fabulous people who just want to dance on the street too, it was so incredible to see people enjoying music from wherever they may be passing through. As well as the street entertainment, there's a whole lot of incredible bars that have a whole lot of live bands to sink your teeth in to. I absolutely loved the different vibes that each bar had to give, it was so refreshing experiencing something different compared to the bars we're used to in London, or our U.K home towns. A dream of mine is to have an underground jazzy space, where you could come and experience a bit of New Orleans for yourself! The best bit about New Orleans's nightlife, is that if you're not enjoying where you are, hop on in to the next bar! or, simply stroll the streets with a cup of drink, since that's legal there so why the hell not! The Beale street music festival seemed to fall on the dates whilst we were in Memphis, RESULT! We headed down in the evening to check it out, turns out that Kings Of Leon were headlining that evening! This has been an absolute dream of mine, to watch KOL perform in their home state. They were incredible to say the least, banging out all the old tunes like there was no tomorrow! The vibe of the festival was awesome, everyone was there to have a great time, met a lot of friendly people there too! This festival is a must go to if you happen to be in Memphis at the time it's on. Check out the website here for tickets for next years festival & the Tennessee tourism board here. Now, the last time I repelled down a mountain was when I first went to Thailand, let's just say it didn't go as planned & I ended up sobbing my heart out whilst trying to bounce down a mountain. So when we were told about our surprise in Fort Payne Alabama, my heart dropped a little. We were going to be repelling down a mountain in Alabama. This mountain was 10x more of a mountain compared to what now seems diddy mountain side in Thailand. The buzz within the group was alive, everyone was a little nervous to take on an activity they're not used to doing. With a little encouragement from the group I was on that buzz too, and couldn't wait to conquer my fear! Guys, It went swimmingly! Until, I hit half way and decided to look down, then I freaked out a little. Though when I reached the ground I was buzzing with excitement it was amazing. We went with True Adventure sports for our activity, we also had a little tour of the amazing location we were in too. Check out the Alabama tourism board here. After our adrenaline dropped we were keen to get some food in us! we headed to the wild flower cafe in Alabama, as we began our journey to Gatlinburg TN. I just HAD to mention this wonderful cafe, since this is hands down probably the best meal I can ever remember eating. This little gem called The Wildflower is tucked away off of a main road in Mentone Alabama, and trust me when I say it is just so gorgeous. The menu was extensive, packed full of delicious goodness, I was absolutely spoiled for choice! I decided to go with a four cheese quesadilla, with added marinara sauce, black olives AND extra pickles (of course!). This main came with a portion of freshly cooked oven chips, which tasted sensational. In fact, the whole meal was an absolute sensation. Believe me when I say I've never enjoyed a meal so much in my life! It was one of those meals that you just wish would go on forever, ya feel? After being stuffed to the brim with our wonderful mains, there was dessert waiting for us as we were about to leave... peanut butter cheesecake. This thing was decadent, the most creamiest, tastiest peanut butter dessert I've ever eaten. We were in heaven. Thank you so much Wild flower for making this meal so memorable. I will travel back to Alabama just for this meal one day. What else I loved about this beautiful place, was that it was also a home to local artists. Some of the most beautiful hand made pieces I've ever seen. I absolutely regret not taking home one of those rainbow crochet scarfs with me, I hope one will be sitting with my name on it next time I come back! Whilst in Alabama, we visited the historic city of Birmingham, which is known for it's activity in the 50s and 60s within the civil rights movement. 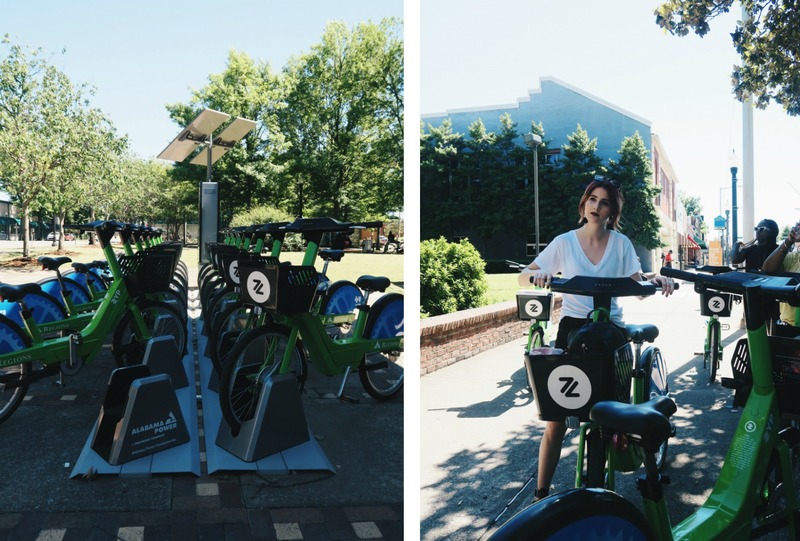 We had a planned bike tour throughout the city using the Zyp bikes, which is a bike share service that has recently come to Birmingham. This allows people to hire these bikes from check points for up to 45 minutes at a time, all you need to do is make sure you're registered for the service and you're good to go! We had a fantastic bike tour from the wonderful Barry McNealy, who is a local history teacher in Birmingham and hosts his own tours around the city (check out his tour contact information here), and he is probably one of the most informative guys you could ever come across in the state! I've never been so interested listening to a guy speak so much about the local history of a city. Being on the Zyp bikes was an incredible way to see the city, there were so many historical points where we rode to, so do check out and see if you can get yourself a local guide, it makes all the difference! Whilst we were in Nashville we had a surprise activity, which turned out to be a SONG WRITING SESSION AT CURB RECORDS!! Curb records is an independent record label, & was started back in 1962. Curb Records has achieved 433 #1 records, over 1,500 hundred Top Ten records and charted over 4,500 total records. Top music from Tim McGraw, the Righteous brothers, Dylan Scott, Lee Brice & Hank Williams Jr have came from Curb, as well as a tonne more artists. We were incredibly fortunate to spend this time with Billy Montana, who has wrote many hits for many country singers. Billy was an incredible host for all 10 of us, we even wrote a whole song together in the short amount of time we had! It was such a creative session, which got each of us engaged with creating something new together, I LOVED it! There are SO many memories waiting to be made on a Trek America trip, if you are looking for one for you make sure you check out which routes Trek America has to offer. There are SO many trips that cater for everyone, so see which one fits you by exploring the different routes Trek America offer here. The trek we embarked on was the Deep South BLT, would I recommend it? 100%! I LOVED the deep south so much. Read about my top things to see in Tennessee here. This Trek America trip is the absolute dream! Absolute scenes you were in Memphis for Beale Street's festival- I can only imagine! I find it kind of charming being in a super musical place with tons of musical history, whilst listening to live music! I'm dying to visit there so much, I dig the blues. Looked like such a class trip, I glad you had fun! The Birmingham Locksmith send has professional licenses being an assurance that our group is experienced to address any difficulty. The locksmiths bring with them tools and equipment to do unleashing tasks actually fabricating brand new hair as well as secrets of repair the issues the client’s encounter.